Knights! reveals the fascinating place of arms and armor in the broader context of history, storytelling, and art. Only three months after the closing of Worcester's Higgins Armory Museum, this exhibition marks the first step in the long-term integration of arms and armor into the collection of the Worcester Art Museum. This process ensures that a treasure of national importance remains in Worcester and continues to delight future generations of museumgoers from within the city and across the region. “Integrating the Higgins collection allows us to build on our creative programming and community engagement and is an incredible opportunity to develop a new approach to presenting these beautiful works of art," said WAM Director Matthias Waschek. 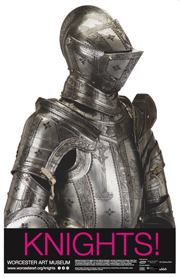 By showcasing arms and armor in the context of its encyclopedic collections, the Museum creates a new framework for exploring this material. Breaking from the traditional forms of installation, Knights! encourages visitors to appreciate armor for its aesthetic and social purposes, as much as its martial one. The pieces included in Knights! are largely from Medieval and Renaissance Europe, with additional cultures and periods represented as well. The exhibition's five separate sections—Courtly Pursuits, The Dance of Love and War, Knights of the Round Table, Triumphal Arch, and The Corridor of Good + Evil—illustrate in detail the historical context in which these works were made and used. Within the final room of the exhibition, viewers can compare and contrast wars of the past with those of the present, drawing on information about real-time conflicts as seen through the lens of photojournalism. In Veiled Aleppo, Milan-based photojournalist Franco Pagetti documents the transformation of this ancient city's streetscapes as a result of the ongoing Syrian civil war. Knights! invites family participation and provides new ways to see arms and armor for all ages. 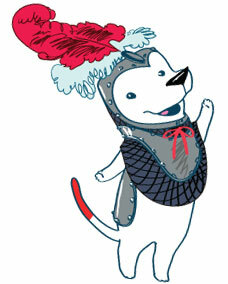 The adventures of the Higgins' mascot, a dog suited in armor named Helmutt, is a family-friendly element of the show. Throughout the exhibition, Helmutt engages children through illustrated signage and interactive iPad stations that encourage fun exploration of the featured objects. In addition, Helmutt's House, a special interactive area within the exhibition, lets our youngest visitors explore the theme of knights in a fun, hands-on way. 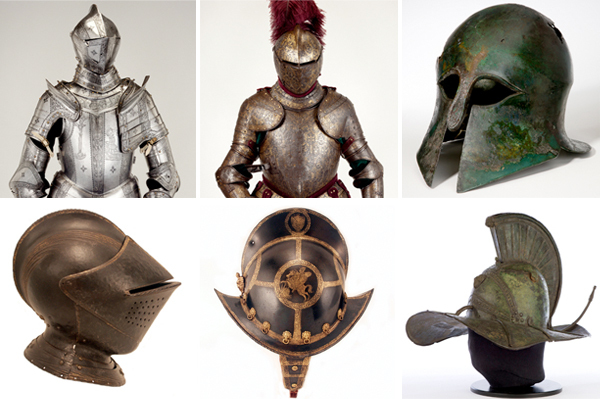 One of the most significant collections of arms and armor outside of Europe, with approximately 2,000 pieces, these treasured objects will be fully incorporated into the Worcester Art Museum in a second phase installation by 2020. For more information on this long term vision, visit our frequently asked questions page. Significant funding for the Higgins Armory Collection Integration has been provided by The George I. Alden Trust,Fred Harris Daniels Foundation, Inc., The Fletcher Foundation, The George F. and Sybil H. Fuller Foundation, The Stoddard Charitable Trust, and The Manton Foundation. Additional support has been provided by the Hoche-Schofield Foundation, the Rockwell Foundation, and the Massachusetts Cultural Council. and I can't wait to meet you in Helmutt's House in the Knights! Exhibition. Get to know her four cats: Mystery, Miles, NeeChee, and Sabbath. Part of the exhibition Meow. Click to learn more about Helmutt! To arrange a private, guided tour for your group of 10 or more please visit our Group Tours page. For a list of current and upcoming related youth and adult classes, and to register online, visit our Education Classes page.